The Rosenberg Foundation released a new report on the movement to restore employment rights to formerly incarcerated people. Over the last decade, this powerful movement led by formerly incarcerated people has elevated the issue of employment discrimination against people with criminal records and scored significant policy wins at all levels. 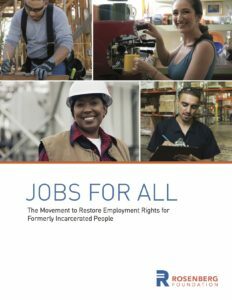 The new report, “Jobs for All: The Movement to Restore Employment Rights for Formerly Incarcerated People,” provides an overview of the most significant policy wins to date and outlines the priorities that are essential for expanding employment opportunities.